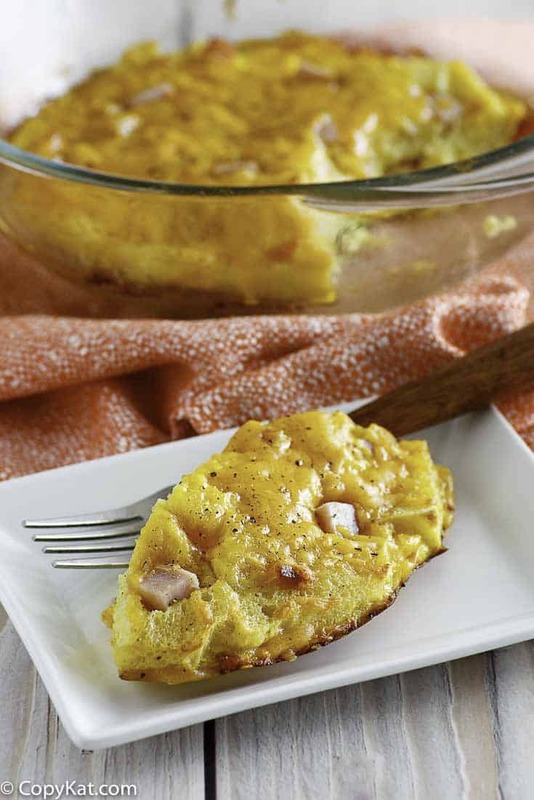 When you make the Cracker Barrel Ham and Egg Casserole you can enjoy this delicious breakfast at home. There is nothing better than a leisurely breakfast. I love to have a hearty breakfast in the morning, but as I am not a true morning person, making an elaborate breakfast for me is difficult. Here we have Cracker Barrel’s Ham and Egg Casserole, their recreation of strata. This recipe is one that you can prepare the night before, perhaps while you are cooking dinner, and then pop into the refrigerator. The next morning, take it out and place it into a hot oven for about 30 minutes, and you have a hearty breakfast. You may want to substitute the ham for another type of meat in your refrigerator, or you may even want to go meatless. This recipe can be made in a million different ways. 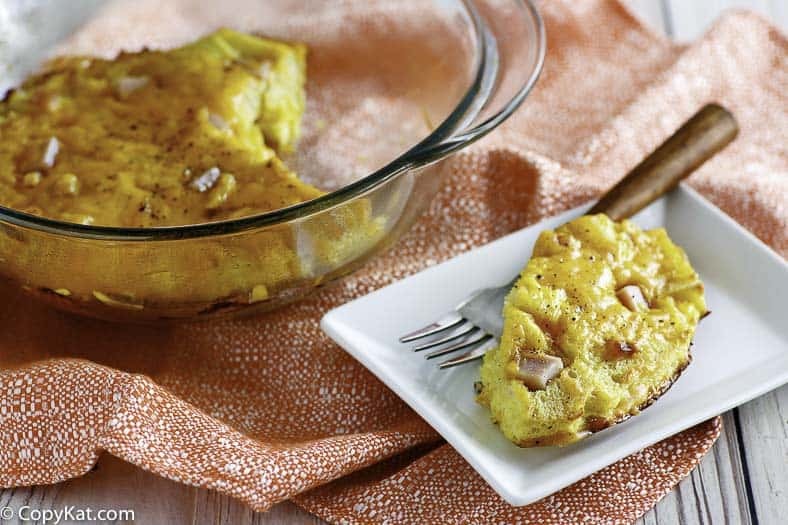 This breakfast casserole is the perfect make-ahead casserole to enjoy for when you have company or to enjoy over the weekend. 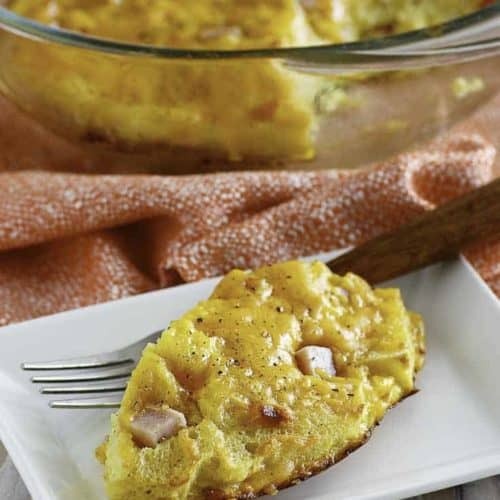 Cracker Barrel Ham and Egg Casserole is a great ahead make a meal that you can serve for your family. Preheat oven to 350 degrees. Spray casserole dish with a non-stick spray and place sourdough bread on the bottom of casserole dish. Beat eggs; add salt, pepper and evaporated milk and mix thoroughly. Pour egg mixture over bread. 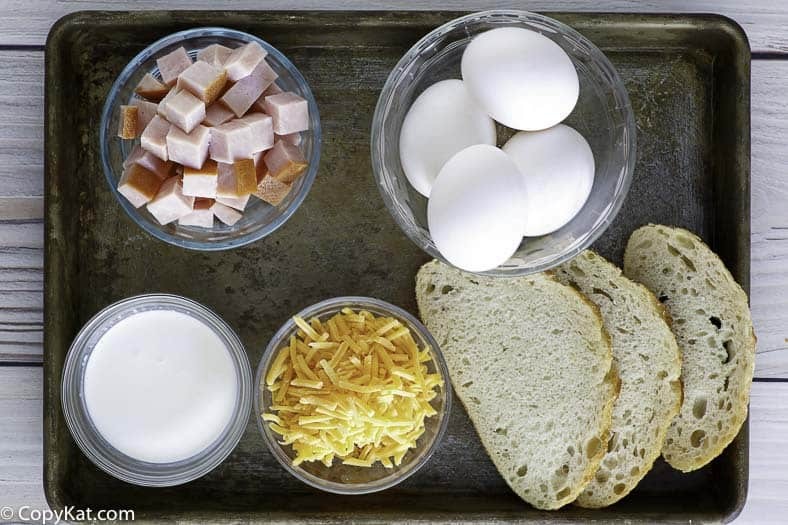 Sprinkle diced ham and shredded cheese over egg mixture and cover with plastic wrap or another type of lid. Place casserole in the refrigerator overnight or in refrigerator for at least five hours. Bake for 20 to 22 minutes, depending on the depth of the casserole dish. You will know this is completely done when you shake the dish slightly and the eggs do not wiggle. As a former employee at C.B. I have made all their recipes. The key in this recipe is the C.B. sour dough bread. There is nothing like it. You just cut it into 1 Inch cubes, no need to cut crust off. The liquid is 2 parts egg to 1 part milk. I made these in quantity so I used 3/4 gallon of the egg mixture. Pour the liquid over the bread making sure it is all saturated. Add whatever kinds of meat or vegetable you like. Cover with shredded colby and bake. Make sure you spray the baking dish with oil. What is the pan size. You only use 1 slice of bread.. Can you use white or wheat bread. I use a 1 quart sized baking dish. In the restaurant, they use white bread. You can use either. A sliced of bread? How big or thick of a slice, look like I would need 2 to 3 sliced of bread to cover a loaf pan. Or does it matter? I used normal sandwich bread for this recipe. That’s a long time to preheat the oven. Kathy, my husband and I ate this nummy casserole at Cracker Barrel while traveling for Christmas. Because the taste and appearance were fresh in my mind, I knew right away what was missing. Sprinkle about a tablespoon of diced pimento and two-three thinly sliced green onions, with the ham, over the bread. When you whisk the eggs, use about 1/3 cup of heavy cream wrather than evaporated milk, AND add about a teaspoon of the juice from the pimento jar. Be certain to let the cassserole sit overnight, if using for breakfast, or for at least 8 hours during the day, if you are doing breakfast for dinner. Also, the waitress at Cracker Barrel advised they use cojack and cheddar cheeses in the casserole. I promise that if you follow the above additions, you will find that this tastes exactly like the Cracker Barrel recipe. I made this according to the original recipe given, and it didn’t taste at all like the Cracker Barrel version. I tried it again with the modifications Miki suggested, and it turned out wonderful. I added the pimentos and added some of the pimento juice to the egg mixture. I used heavy cream instead of evaporated milk, and used a combination of cheddar/jack and colby cheeses. I used diced up Cook’s Ham Steak. Instead of sliced green onions, I just sprinkled a tiny bit of onion powder on top of the bread and egg mixture along with the salt and pepper. I had to bake mine much longer than 25 minutes though; closer to 40 minutes to get it to where the eggs didn’t wiggle. It wasn’t even close to the taste. I was so disappointed. It would be nice to know what size pan to use! Thank You! Looks like just a regular loaf pan. It was an old glass storage container. I used an antique glass baking dish for this recipe, it wasn’t a loaf pan, but I am not sure what it was. You can use anything that is a 1 quart size. Bake at what oven temperature? I love that this serves 2! I’m going to try it with some of our leftover ham.